Can you believe next week is Memorial Day weekend? Time is going so quickly. 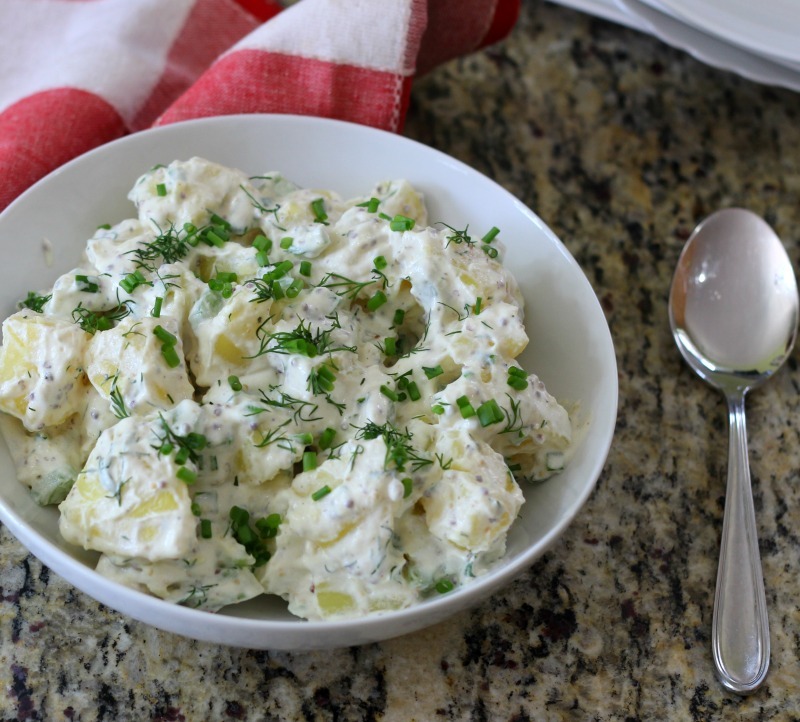 With the holiday weekend upon us, I thought I would whip together a simply potato salad that is a little on the healthy side. Yup, healthy. I’ll tell you more in a bit. 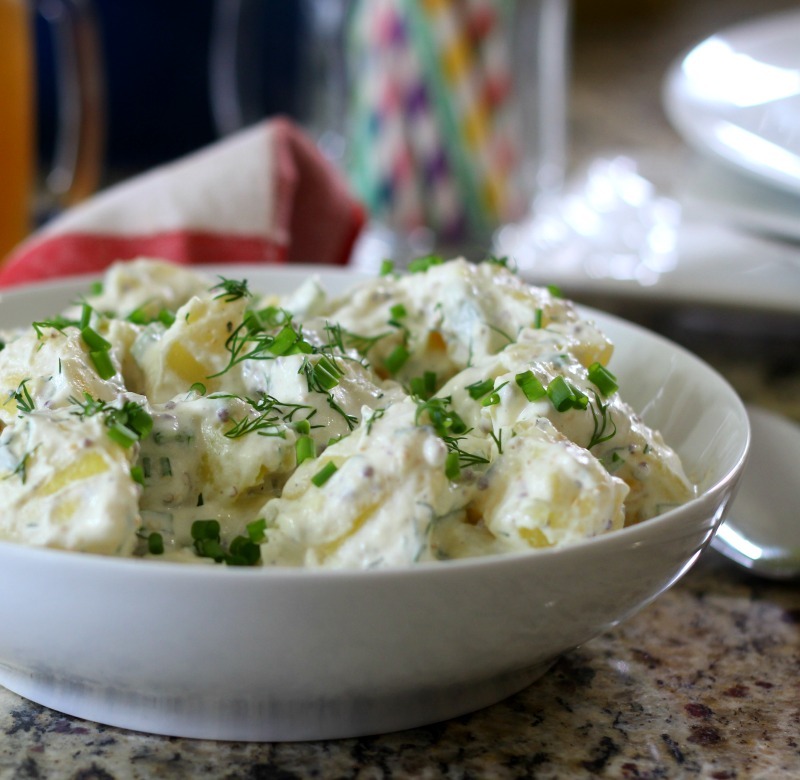 So today, let me introduce to you my Lightened Up Creamy Potato Salad. So creamy good! 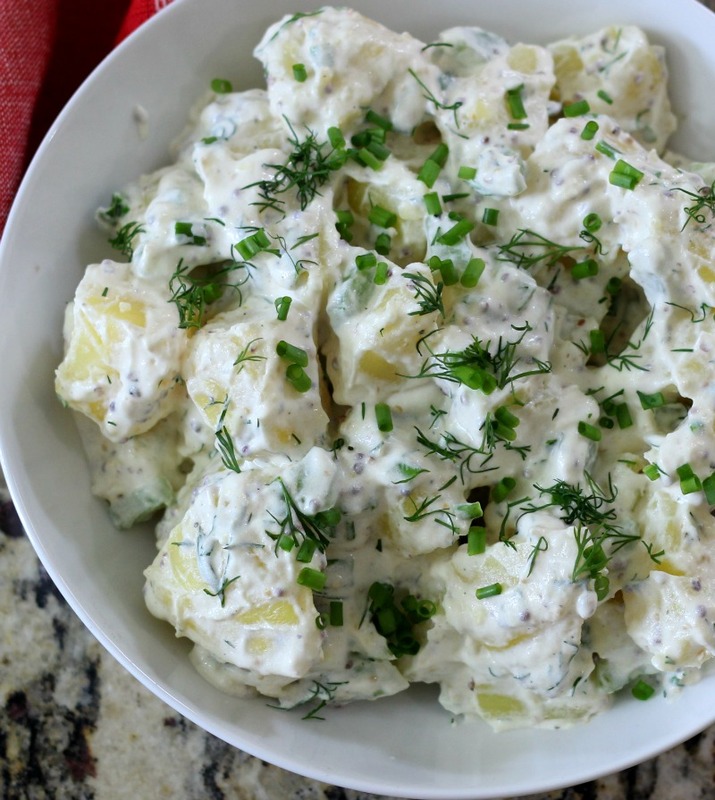 This potato salad tastes so light and refreshing. It’s hard to eat one serving. I added fresh dill to it for a nice seasonal flavor. For some reason I just love dill and potatoes together. Plus I added some chopped celery for crunch. Then some scallions instead of onion for a simple, but nice savory flavor. It tastes amazing. I’m telling you, no one will know it is lightened up. For the potatoes I used Yukon Gold. I like these kind of potatoes because they taste so creamy. For the mixture, I used a little bit of mayonnaise, Greek yogurt, Dijon mustard and a pinch of distilled vinegar. It kind of tastes like the center of a deviled egg without the egg. I love using Greek Yogurt with mayonnaise or sometimes instead. You get a extra protein and no fat, if you go with non-fat yogurt. I just mixed all of this together and stirred it into my potatoes. It’s so light and creamy. I added a pinch of salt and pepper for extra flavor. 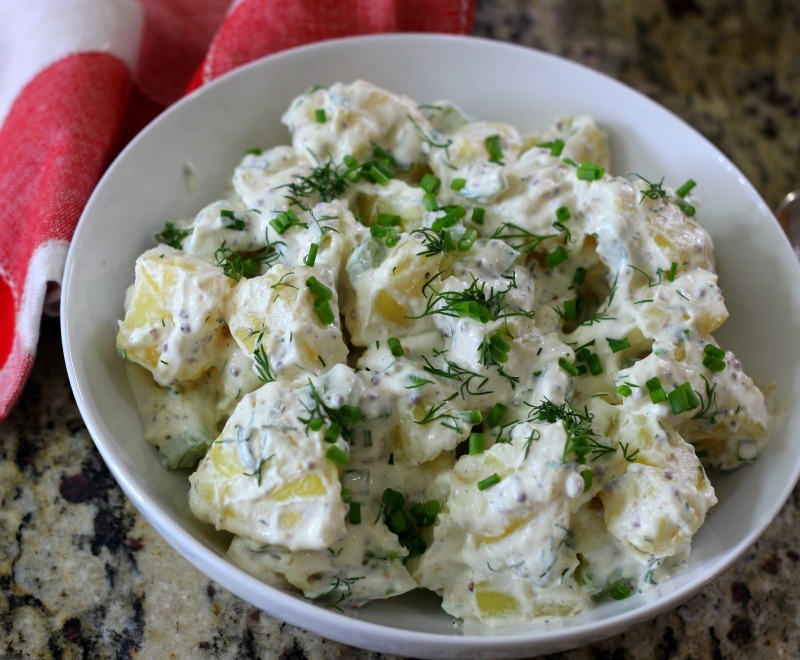 Light, creamy, fresh tasting potato salad made with a yogurt and mayonnaise and topped with fresh dill and scallions. In a large pot, add about 6 cups of water. Turn heat to high and bring water to a boil. Add potatoes and cook until fork tender; about 10 minutes. Drain potatoes, and let cool. Meanwhile in a bowl, add mayonnaise, yogurt, vinegar and mustard. Mix until well combined. In a large bowl, add the potatoes, and celery. Mix in yogurt and mayonnaise mixture until well combined. Taste test and add salt and pepper. Stir in scallions and dill. Refrigerate for at least an hour until ready to serve. The longer it's chilled the better it tastes. 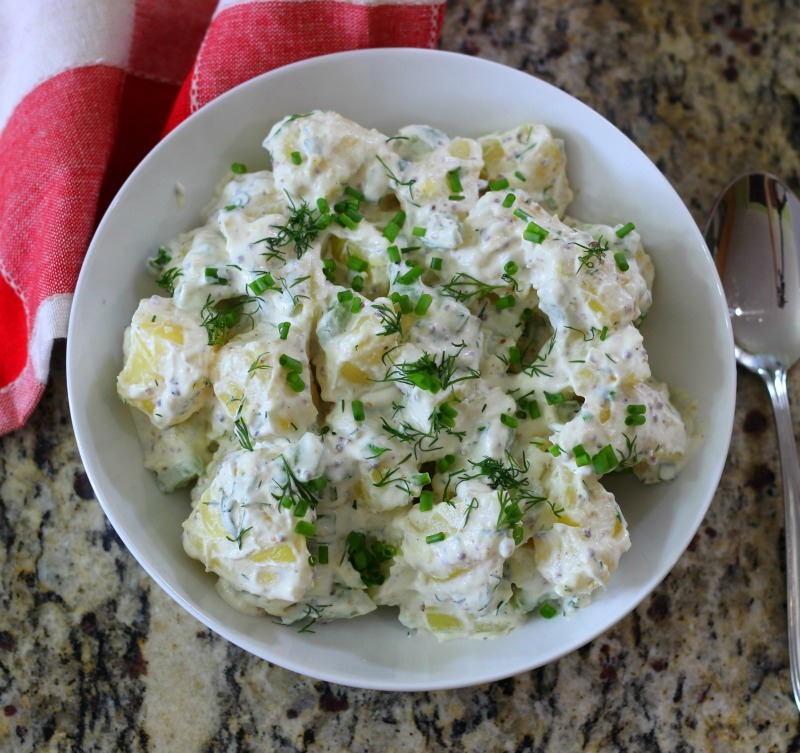 Did you know that most potato salad has 357 calories and contain 20 grams of fat? That’s why I love my recipe. It only has 210 calories and 8 grams of fat. That is guilt-free if you ask me.